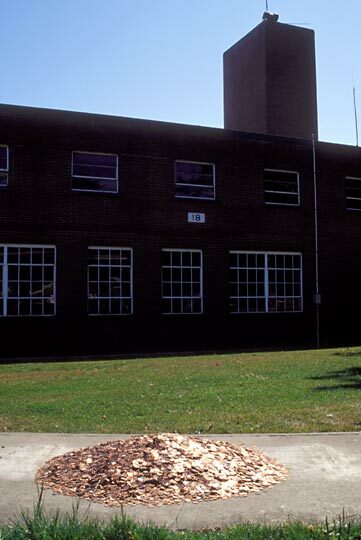 The entire $500 honorarium from the Sand Point Arts and Cultural Exchange was converted into pennies and placed at a public corner at Sand Point with a Do Not Touch sign. The pile lasted two weeks and then disappeared overnight. While it was there, silver coins were found added to the pile on several occasions. A few pieces of costume jewelry were found in the pile as well. The parks department reported that at one point some children living nearby were found by their parents to have filled their backpacks with pennies and hauled them home. The parents made the kids put the coins back and to add their allowance money. A few days later all the coins were taken. Concepts that inspired this artwork: Distribution of wealth, erosion, all-you-can-eat, take-what-you-need, sink holes, money pits, death by a thousand cuts, gluttony, preservation, donation, allocation, free refills, oxygen bars, strip mines, pruning, skimming, looting, and dirt.